Shadow Chancellor Vince Cable has warned that the backlash from Labour’s 10p tax gaffe could cost them up to 100 seats in Wales on Thrursday. Labour are currently the largest party across Wales, but the popular backlash against Gordon Brown’s decision to double the income tax rate for 195,000 people in Wales has put Labour under pressure. Some councillors and candidates have even taken to removing the word "Labour" from their election material, and in Wrexham Labour councillors have written to residents urging them to ignore the National picture and vote only on local issues. Speaking during a campaigning visit to Cardiff, Vince Cable said: ""The abolition of the 10p rate is clear evidence that the Prime Minster has lost all touch with ordinary people. "The Labour Party has turned its back on people in Wales, so it shouldn’t be surprised that people are turning their backs on Labour. The 10p tax issue goes to the heart of Labour’s problems and could cost them 100 seats in Wales alone at this election." Cllr Rodney Berman, leader of Cardiff Council, added: "In Cardiff and across the 21 other local authorities in Wales there is a great deal of unhappiness at Labour’s tax grab. It’s an issue that keeps cropping up on the door step. "Welsh Liberal Democrats understand that people are feeling the pinch. That’s why we are proud of our record of keeping council tax rises down in the councils we lead. Of all the parties in Wales the Liberal Democrats have produced the lowest average increases in council tax – while putting greater investment in front-line services like education. Here in Cardiff we have produced the lowest increase in the whole of Wales just averaging just 2.8%"
Losing personal data took a step closer to becoming a criminal offence after the House of Lords backed a change in the law. Peers supported an amendment to the criminal justice and immigration bill which would make it a criminal offence to carelessly release or lose personal data. The amendment, proposed by Liberal Democrat Lady Miller, would make it an offence for anyone to "intentionally or recklessly disclose information" or "repeatedly and negligently" allow information to be disclosed. The amendment must be sanctioned by the House of Commons before it can become part of the bill. It follows calls by the Information Commissioner Richard Thomas for the criminalisation of reckless data loss earlier this year. In January of last year, BBC-Wales was reporting that: "One of the main issues in Neath Port Talbot is the future of the controversial incinerator and recycling centre at Crymlyn Burrows. The council is hoping to settle a legal dispute to pave the way for a new private investor to run the site." Residents will remember the fire of 2004 and the £40 million bankruptcy of the PFI company in 2005. In March 2007, Peter Black AM called for continuous monitoring of the air near the incinerator, with particular reference to dioxins. To date, there have been two spot-checks, using the Environment Agency's mobile laboratory, in 2002 and 2003 - that is, before the fire and reconstruction. We await news on both fronts. With all the accusations of collusion and electoral misbehaviour flying around Neath Port Talbot, one would imagine that the council's standards committee was in permanent session. We understand that the opposite is the case, and that the standards committee has not been constituted for at least six months. Could it be that there are outstanding referrals which, if heard, might prove embarrassing to councillors this side of local elections? It doesn't take long to find the cost of the full-page advert which Neath Port Labour took out in the Evening Post yesterday (Saturday). Northcliffe Media publishes its rates on the Web. It's just over £2,850. Add to that the cost of two centrally-produced glossy leaflets which individual candidates are putting out, and it is clear that Labour is trying to spend its way to victory, in the American way. Peter Hain's unsuccessful bid for the Labour Party deputy leadership should warn them that throwing large sums of money at an election campaign is no guarantee of success. Such an advertisement is unprecedented in Neath Port Talbot local elections, and smacks of desperation. As to the accusation that election of Liberal Democrat councillors would jeopardise education or refuse-collection in the county borough, that can easily be answered by the priority given to schools by LibDem-led councils in other parts of Wales (at or above the average, judged by the Welsh Assemhly's measure) and by the dominance of the table of best recyclers in the UK by LibDem-run councils. 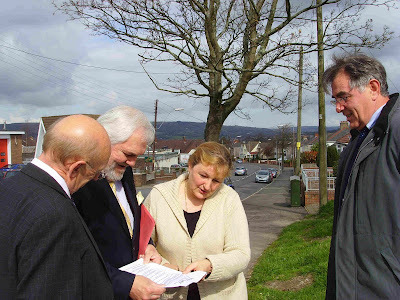 Candidates and LibDem councillors accompany Mike German, the Welsh party leader, as he discusses the problems of Tonmawr Road with prospective constituents. The road connects over two hundred households - and growing - with the rest of the ward of Pelenna and thence with the town centre. There is no footway on either side for almost a mile, and no alternative footpath. The street lighting is no more than adequate. At a time when we should be encouraging people to leave their cars at home and take more healthily to their feet, roads without footways or cycle-tracks are a great disincentive, particularly at night. We understand that Labour has consistently before council elections promised to have this road improved, only to forget about it once in office. The official story from the engineer's department is that, because the road is unclassified, there is no legal requirement to provide footways. “The Conservatives’ hypocrisy over the Government’s post office closures is astounding. “Over 3,500 post offices closed under the Conservatives’ watch. “They had their chance to save the post office network and they blew it. Our plan would give a real investment of £2 billion in the post office, would increase the services offered at local post office branches and improve the network so that every community that needs a post office gets one. We are the only party with a fully-funded plan to save the post office, give it a long-term future and not just manage its decline, as Gordon Brown's doctrinaire attitude inevitably does. * The Post Office freed from Royal Mail restrictions to let it develop new business. Research by the Welsh Liberal Democrats reveals that 195,000 people in Wales, have seen their income tax double – thanks to Gordon Brown’s tax bombshell. Ahead of their debate this afternoon, research by the Lib Dems has also revealed that Wales will be harder hit than England by the tax hike. While 11.8% of taxpayers in England will be affected, the figure in Wales – where wages are lower overall – will be 13.3%. Peter Black, AM for South Wales West, and Social Justice spokesperson for the Welsh Liberal Democrats, said: “These figures show clearly that nearly one in seven people in Wales will see their tax bills double under Gordon Brown’s plans. No wonder so many people are angry about it. “195,000 people in Wales only pay the 10p tax rate. Their income tax rate has doubled. Labour’s tax gaffe is proving to be a major blunder ahead of the local government elections. “The simple fact is that poorer people are paying more thanks to Gordon Brown’s last budget. That’s not social justice. It’s not fair. And people don’t like it. Frank Field, MP for Birkenhead, and one of the most conservative of Labour members, has as a result of a concession by the Chancellor, withdrawn his amendment to the Finance Bill 2008. This would have provided compensation for the estimated five million people who are worse off as a result of Gordon Brown's budget. It remains to be seen how effective the promised compensation deal is. It comes after a week of fudges. Yvette Cooper announced a review into poverty. Nick Clegg commented: “After weeks of pressure from all sides, all this tired Government has been able to come up with is yet another review. “The Treasury shouldn’t need to ‘consult stakeholders’ to work out the impact of doubling the rate of income tax for people on low incomes." “The level of fuel poverty in this country is a scandal, with over four million households struggling to meet the soaring cost of energy. The last thing they need is another talking shop. that up by boosting investment in fuel efficiency measures." Yesterday, we also learned that the Government will delay the release of child poverty figures until June, well after the local elections. They are expected to show a further widening of the wealth gap. “Gordon Brown’s pledge to support working families is looking more superficial by the minute. “The Prime Minister must come clean about the real impact of his Tax Credits system; it gives with one hand and takes with the other. Ending the 10p tax rate means the Government is taking even more from low-income families. “It is grossly unfair that families who want to work harder have so little to show for it thanks to a system of complex, means-tested benefits. “The Government has had ten years to tackle the appallingly low levels of social mobility in Britain but has barely made an impression. Britain is more unequal now than when Labour came to power. The 10p tax rate doubling is just one example of a policy that makes matters worse, not better. “It is a disgrace that in Britain a person’s chances in life are more likely to be determined by their background than anywhere else in Europe. “Labour is more interested in creating giant, centralised systems that take power away from people than in empowering them to make the best of their lives. “The Government needs to explain how it will support the families who have stretched themselves to buy a home and are now faced with sky-high mortgage repayments and the threat of negative equity. b. The average mortgage repayment in 2007 was £827.87 and in 1997 it was £304.80 in 1997. Figures revealed by the Liberal Democrats earlier this month have shown that 60,000 families are at high risk of repossession after spending over 75% of their disposable income on mortgage repayments. In the normal scheme of things, this year's outgoing deputy mayor, Cllr Gunter, would already have been nominated as the mayor for the county borough for 2008/9. The council usually resolves the succession in February of each year. Our councillors have told us that, this year, no decision has been reached. One can only speculate on the reason. Gordon Brown’s local difficulties over the doubling of the 10% tax rate have enabled him to avoid questioning over his summit with George Bush. “The Prime Minister has again met President Bush to discuss security issues, yet his unwillingness to allow proper debate on the siting of US missile defence components in this country smacks of arrogance. “Brown is clearly more concerned with maintaining the special relationship with the US than he is with the people of this country. “MPs were promised a debate on missile defence by Tony Blair, but Gordon Brown rushed out plans to site US missile defence installations at Menwith Hill on the last day of Parliament. NATO has discussed it, Brown and Bush have discussed it again, and yet our own Parliament has not been given the opportunity. “Is this the ‘new politics’ we were promised when the Prime Minister came to power? “It is a scandal that unsustainable and heavily subsidised fuel is being imported from the US and described as environmentally friendly. Ministers must push the EU to close this loophole immediately. (The Government’s sustainability standards for the Renewable Transport Fuel Obligation allows companies to answer ‘unknown’ to the question of what the previous land use was on the 30th November 2005 and still be eligible for a Renewable Transport Fuel Obligation certificate. Hain fake emails - who started the smokescreen? Guido Fawkes gives the background and Peter Black comments. “It is obviously necessary for urgent action to be taken to unblock the mortgage market and to break the crippling effects of the credit crunch. 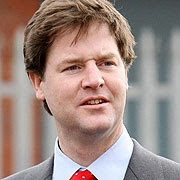 “However, we cannot have a situation where the banks are able to privatise their profits and nationalise their losses. “Since the mortgages from the banks are of inferior quality and higher risk than the Government bonds which they are replacing, the implication must be that taxpayers are shouldering the risks and losses of the banks. This cannot be right. “We need urgent reassurances from the Government that the exchange is taking place on a discounted basis so that the banks and not taxpayers carry any losses. “In return for bailing out the banks, the Government must now insist on an orderly programme for identifying the losses in the banking system to ensure the banks themselves cover those losses by stopping dividend payments and raising money from their shareholders. LibDem councillor for Coedffranc North in Neath Port Talbot, Keith Davies, handed in a petition on unadopted roads to AM Peter Black on Wednesday. Although these are a problem in many parts of Wales, this is the first petition on the subject to be presented to the Welsh Assembly Government. The petition calls for part of the block grant to be earmarked as seed money for schemes to bring these roads up to local highway authority standards. Our local Assembly Member, Peter Black, has won both the National Assembly's Legislative Competence Order (LCO) ballot and the Private Member's Measure ballot. He could have a good chance with his Private Members Measure, which would oblige local authorities to meet the demand amongst young people for leisure and education-based facilities. However, his bid to secure a LCO to enable the Assembly to decide on the best electoral method for voters in Wales is probably doomed. Along the way, however, Peter should be able to generate a useful public debate. Up to 60,000 families are at a high risk of repossession - double the number who had their homes repossessed last year - Liberal Democrat analysis of official figures has revealed. The figures show that the families affected are spending over 75% of their disposal income each month on mortgage payments alone. “There are 60,000 families teetering on the edge of losing their homes, weighed down by massive debts. “As living costs rise, and the credit crunch starts to bite, families are forced to cut back on essentials in order to keep a roof over their heads. “But Ministers are not prepared to deal with the housing crash as the safety nets have been withdrawn. There are almost a million fewer social homes to rent than during the last recession while the number of families waiting for housing has skyrocketed. “This Government has buried its head in the sand, and it is overstretched families who are paying the price. “Ministers must act decisively and commit resources to a national network of financial advice centres, with face-to-face services that are free at the point of use. The Neath Port Talbot Liberal Democrat campaign was formally launched on Cimla Common this morning. Pictured are four of our candidates - Cllr John Warman (Cimla), Cllr Keith Davies (Coedffranc North), Annette Sparkes (Pelenna) and Des Sparkes (Cimla) - checking election literature, after the formal pictures were taken. These should appear in the local press soon. Coedffranc North councillor, Keith Davies, is to petition the Welsh Assembly Government to release a percentage of its block grant for the making-up and adoption of these private roads. Under the old council rates system, the state of a street was reflected in the rateable value of the property. There was no such dispensation with the Poll Tax, or, now, the Council Tax. As a result, many residents feel they have paid many times over for services they have never received. In addition to the petition to the Assembly, Cllr. Davies will be contacting our local Assembly Members and Paul Murphy, MP, Secretary of State for Wales. Today I have written to the Prime Minister asking him to pull out of this weekend’s ceremony welcoming the Olympic torch to London in advance of the Beijing Games. When China made its bid to host the Olympics, the Deputy Mayor of Beijing said that this was an indication of China’s wish to “promote” democracy and human rights. But it has done nothing of the sort. Recent events in Tibet, broken promises over media freedoms, ongoing human rights abuses and intransigence over the humanitarian catastrophe in Darfur have made a mockery of China’s “commitment” to progressive freedoms. As the prospective host of the 2012 Games, Britain has a particular responsibility to hold China to account for its broken promises and its poor record on human rights. Gordon Brown should not attend this weekend’s event or any future events to mark the Beijing Games - including the opening ceremony on 8th August – until China lives up to the expectations placed upon it by the Olympic Charter. The Charter states that “Olympism seeks to create a way of life based on the joy of effort, the educational value of good example and respect for universal fundamental ethical principles”. China should do that by taking four clear steps. First, President Hu Jintao should agree to meet the Dalai Lama for face-to-face talks on a mutually acceptable solution to the contested status of Tibet and the treatment of Tibetans. Second, China should honour its commitment to allow the free access of foreign journalists to all parts of the country and to talk to any individual who gives consent to be interviewed: China should not use the Olympics as an excuse to further restrict the freedom of its domestic media. Third, as a permanent member of the UN Security Council, China should use its influence in Khartoum to remove obstacles to the United Nations-African Mission in Darfur. Fourth, China should demonstrate its commitment to civil and political rights by ratifying the International Covenant on Civil and Political Rights (ICCPR). I believe firmly in the spirit of the Olympic Games, and in the value of human rights and civil liberties. We should use the opportunity of the Olympic Games to exert pressure on China to live up to those values; and the British government should express its clear disapproval until it does so.